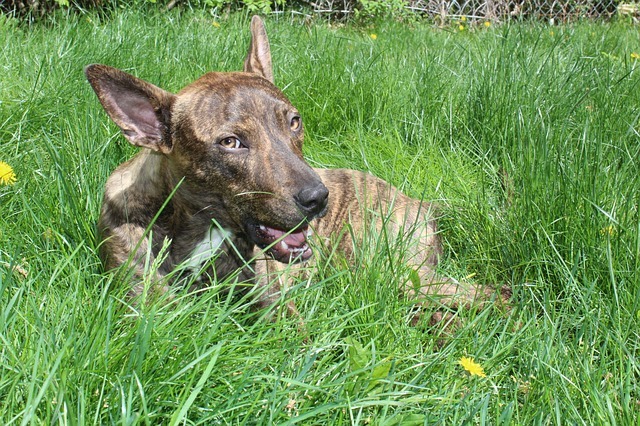 If you’ve ever seen dogs eat grass, you may be wondering whether or not you should be worried. Is it normal for dogs to eat grass? Could it hurt your dog? Why do they do it? Should you be concerned if your dog vomits every time he eats grass? 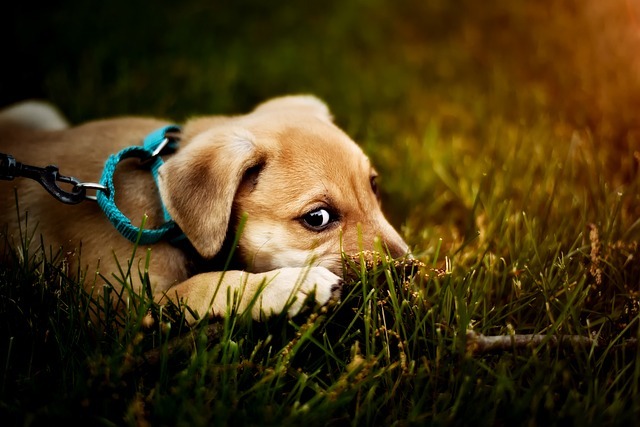 We know you have questions and concerns about your dog eating grass, and we’re here to help. Pica is the term for eating non-food items, and eating grass is the most common form of pica. Grass eating has even been observed in wild dogs, so it’s not a behavior that’s unique to our domesticated fur children. Wolves and other wild canids typically consume their prey whole, including the digestive systems of herbivores that would be filled with partially-digested plant matter. Unlike cats, who are strict carnivores, dogs are omnivores. Dogs will consume whatever food source is available to them, including things like grass, plants, fruits, vegetables, and berries. Grass is high in fiber, so it’s possible that your dog is seeking out something that’s missing in their regular diet. Try switching your dog’s diet to something with more fiber in it and see if that helps. While many dogs don’t enjoy raw vegetables, lightly steamed veggies can be a great way to add more fiber to your dog’s diet. There is a published story about a Miniature Poodle that ate grass and then vomited every single day for 7 years. Within 3 days of being switched to a high-fiber diet, the grass-eating behavior stopped entirely. Does your dog dash outside to gobble the nearest grass they can reach and then promptly vomit? Many dogs seem to have an instinct that if they are having stomach problems, gobbling grass can help them throw up and feel better. Just like humans, every once in a while your dog may feel the need to purge their stomach. Consuming a large amount of grass and air is one way they know how to do that. This should be a rare occurrence, though. If your dog is vomiting once a week or more, you should take them to the vet for a checkup. Less than 25% of dogs vomit regularly after eating grass, so if it’s a regular occurrence for your dog, a vet visit can help rule out a serious gastrointestinal problem. 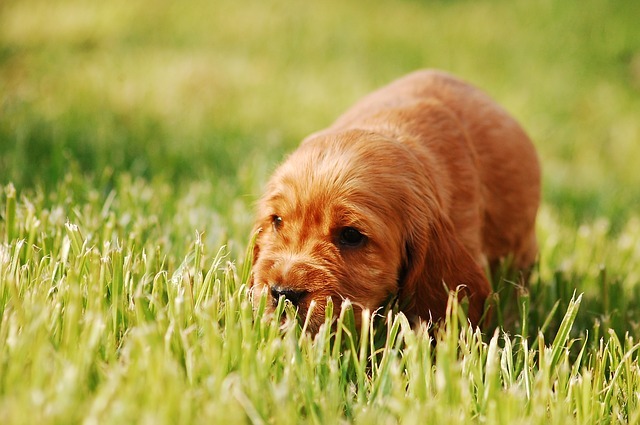 Puppies and younger dogs are especially likely to choose to eat grass out of boredom. If your dog runs around outside for a while appearing to have fun and then idly plops down to start munching on grass, they may just be bored. Try interacting with them more, giving them more exercise, or providing long-lasting chews like bully sticks to keep them entertained without resorting to munching on your lawn. One study showed that nearly 4 out of 5 dogs had eaten plants at some point. Grass just happens to be the most readily available plant for them to do it with. If your dog likes the longer blades of grass, they may just enjoy the flavor of the grass or the way that it feels in their mouth. #6 – Is it dangerous? Grass itself isn’t inherently dangerous for your dog. Although it may contain chemicals such as pesticides or herbicides that could make him sick, it is generally safe. If you’re concerned about what sort of chemicals your dog could be consuming from your lawn, there is another option. PetGrass kits to grow your own wheatgrass for your dog to munch on are a relatively cheap and easy way to provide your dog with the grass he craves without potentially exposing him to dangerous lawn chemicals. Some plants growing around your house may also be toxic if your dog eats them while munching away on grass. The ASPCA’s Animal Poison Control Center has great information about what sort of toxic plants to watch out for. Be proactive if your dog likes grass, so that you can remove them from your yard or find a way to prevent your dog from eating them. By doing so, you can avoid a call to the poison control center and an emergency altogether.